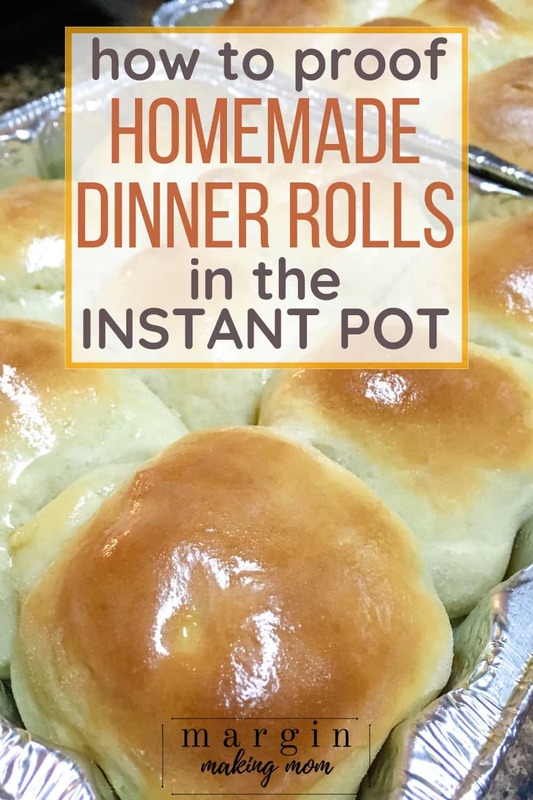 Instant Pot dinner rolls are easy to make when you can proof dough in the Instant Pot! 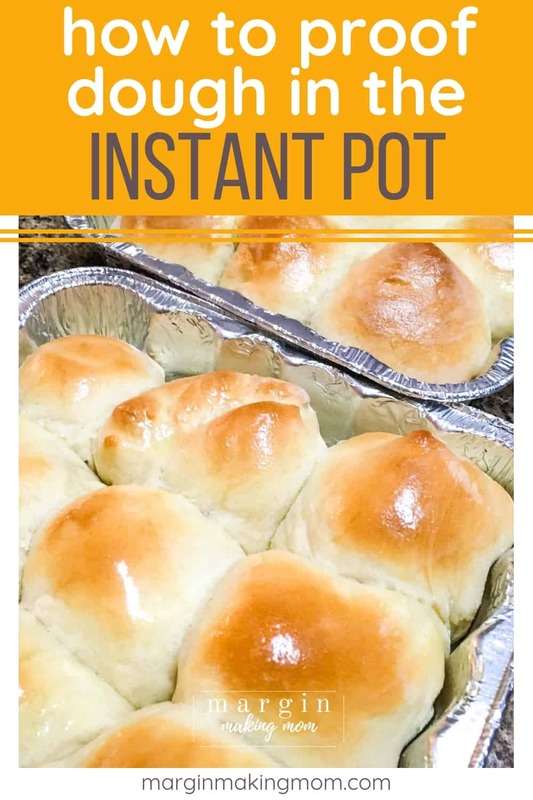 Using the Instant Pot to rise the dough yields soft and fluffy rolls! My great-grandmother was known for her dinner rolls. 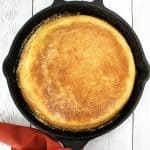 She brought them to every family function, and they were amazing! 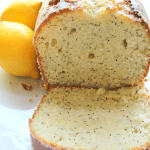 Soft, fluffy, and perfect split open with a pat of butter spread into the tender centers. She passed away when I was a teenager, and I sure do wish I had taken the time to learn her roll recipe. 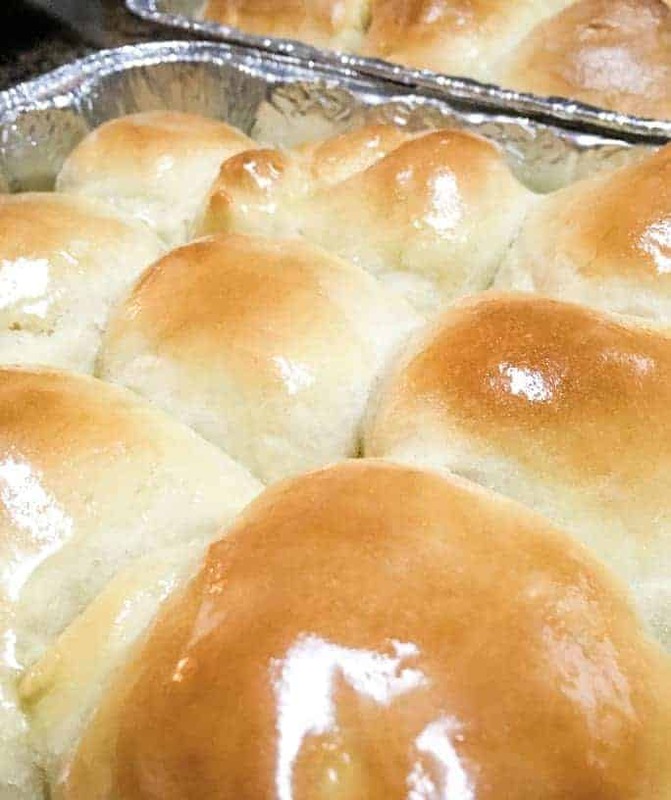 My mom occasionally made homemade rolls, but most often she used frozen Rhodes rolls for our holidays and special occasions. They are pretty darn tasty, but I have to admit that I have a thing for homemade bread. There’s just something about working the dough with my hands and, of course, the smell of fresh-baked bread that makes you feel at home. 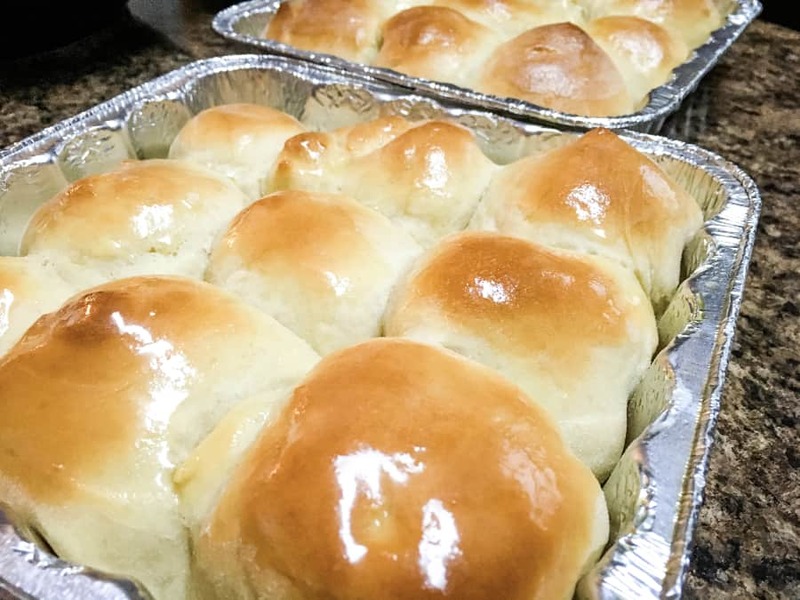 I’ve been making homemade dinner rolls for my family for years. Most often, I’ve used my bread machine to mix, knead, and rise the dough for me. Then I use my hands to shape the dough and allow a final rise before baking. However, this past Thanksgiving and Christmas I was tasked with bringing rolls to our family feast. My bread machine can make enough dough for two pans of rolls, but given their popularity and the crowd we were feeding, I knew I’d need 4 pans of rolls. So I decided to make one batch of dough in my bread machine and make the other batch using the Instant Pot to rise the dough. I’m happy to report that the Instant Pot method worked fabulously! 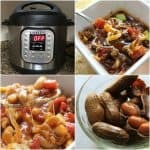 Can You Proof Dough in an Instant Pot? After performing my experiment, I can tell you the answer is YES! And honestly, it’s really simple. The Instant Pot is actually a great environment for proofing dough, because it can be kept at a steady temperature, just like a bread machine does. This creates the perfect environment for yeast to metabolize carbohydrates through fermentation and produce carbon dioxide as a byproduct. The CO2 gas the yeast produces is what creates all of the little bubbles of air in bread and results in soft, fluffy, spongy rolls. 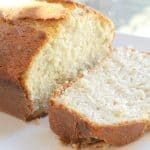 To use the Instant Pot to rise your bread dough, you first have to make the bread dough. I used my KitchenAid stand mixer to make easy work of this process. 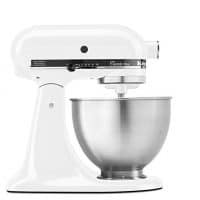 First, you’ll combine all of the dough ingredients into the bowl of your stand mixer, fitted with the dough hook attachment. Use the dough hook to mix and knead this for 10 minutes. Alternatively, you can knead by hand if you don’t have a stand mixer. 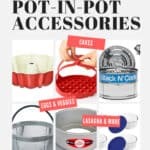 Once the dough has been kneaded, oil the insert pot of your Instant Pot. You just need a thin layer of oil around the bottom and sides of the insert pot so the dough won’t stick too much. I used cooking spray to oil mine. Next, transfer the ball of dough from the stand mixer to the insert pot. Turn it over a couple of times to coat the outside of the dough ball with oil. Next, you’ll place the lid onto the Insert Pot and select the Yogurt setting and allow the dough to proof for one hour. 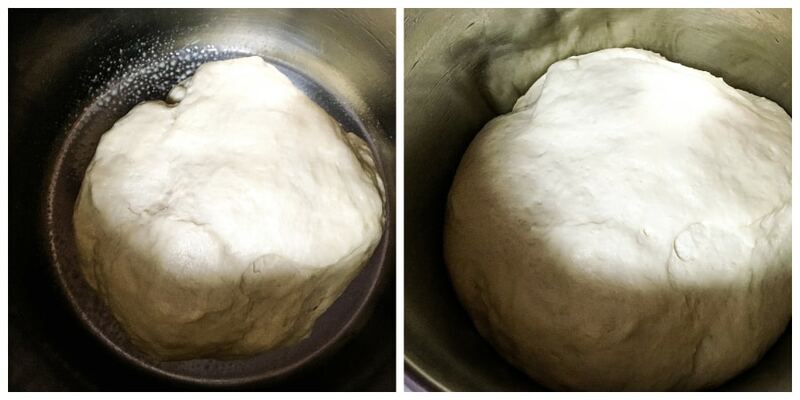 The dough should roughly double in size during that time, as you can see in the before and after photos below. From this point on, the steps are the same as if you had used a different method for the dough rise. Once an hour has passed, punch down the dough and remove to a lightly floured surface. Shape the dough into a ball and cut into 18 pieces that are fairly equal in size. You can do this by cutting it into two halves, then cutting each half into 9 pieces. You could also divide the ball into thirds, then cut each third into six pieces. However you like, just divide it into 18 pieces. Roll each of those pieces into a ball shape. They don’t have to be perfect–just somewhat round. 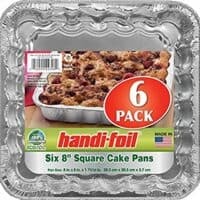 Place nine pieces of dough into a greased pie pan or a round or square 8″ cake pan. Then repeat with another pan, so you have two pans of rolls. If I’m taking these rolls somewhere, I’ll usually use foil pans. Otherwise, I most often use my 8″ round cake pans. 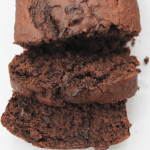 You could also place them in muffin tins or on baking sheets. Allow these rolls to rise in the pans for another 30-45 minutes, preferably in a warmer area away from any cool drafts. I like to put the pans into the oven and use the Warm setting for this last rise. Again, they will roughly double in size, as you can see in the before and after photos below. 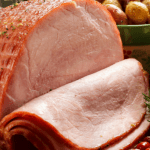 Once they’ve risen, remove the pans from the oven and preheat the oven to 375F. Once the oven is preheated, pop the pans back in and bake them! After they’ve baked, rub the hot tops with a tablespoon or two of butter. Then, enjoy! 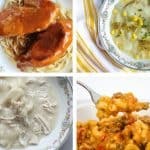 These are perfect for holiday get-togethers, but they’re also just a great staple to enjoy with homemade Instant Pot soups or your favorite comfort food. 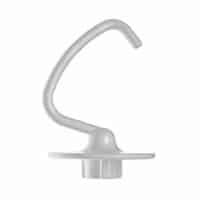 Pour warm water into the bowl of a stand mixer fitted with the dough hook attachment. Sprinkle yeast into the water, stirring gently. Add salt and sugar. Let stand for 3-5 minutes while the yeast begins to soften and foam. Add in softened butter and egg. Turn on the mixer to the Stir setting. While it is stirring, gradually add in the flour, allowing it to combine. Continue with the mixer on the Stir speed, allowing the mixer to knead the dough for 10 minutes. (If you don't have a stand mixer, you can mix and knead the dough by hand). 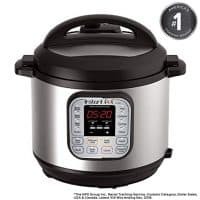 Oil the insert pot of an Instant Pot, so there is a thin layer of oil on the bottom and sides of the inside of the insert pot. Transfer the ball of dough from the stand mixer to the insert pot, turning it a couple of times to coat it with oil. 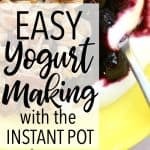 Place the lid onto the Instant Pot and use the Yogurt button. You'll let the dough rise at this temperature for one hour. After an hour, punch the dough down and transfer it to a lightly floured surface. Divide the dough into 18 pieces of fairly uniform size and roll each piece of dough into a ball. Place 9 pieces of rolled dough into each round cake pan. Place the pans in a warm place to rise for another 30-45 minutes. (I put mine in the oven and use the Warm setting). Once the rolls have risen, preheat the oven to 375F (remove the pans first if you had them in there rising). 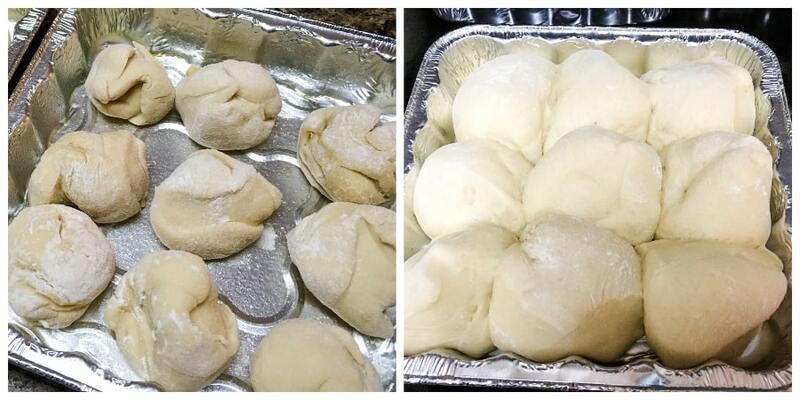 Once the oven has preheated, bake the rolls for 12-15 minutes or until the tops are golden brown. Remove from oven and brush the hot tops with melted butter or just rub a stick of butter over the hot tops. If you prefer smaller rolls, you can divide the dough into smaller pieces. 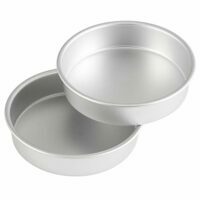 I most often use round cake pans or foil cake pans when baking these, but you can also use muffin pans, baking sheets, or other size pans if desired. If you use a baking sheet, place the pieces of dough approximately 2 inches apart to allow room to rise. 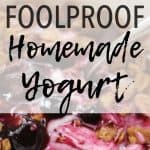 Can this be adapted for an older Instant Pot without the yogurt setting?